Share with us how you customize your recipes to "Make It Mine"
In Boston, St. Patrick's Day is a big deal. The parade in South Boston is always an event and draws a huge crowd from Boston, the surrounding area and across the country. Of course every bar in town is serving corned beef and cabbage as part of the celebration, along with the beer which is flowing pretty well also. So get in the spirit and make corned beef and cabbage for your St. Patty's Day celebration! 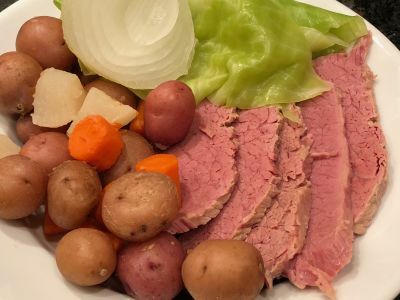 This dish is also known as a New England Boiled Dinner and comprises corned beef, potatoes, carrots, onions and sometimes root vegetables like turnips, rutabegas or parsnips. 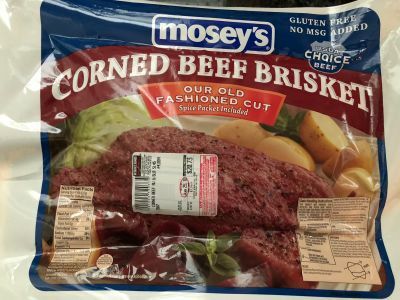 The corned beef can be the kind you find in your local grocery store or one that has been corned by a local purveyor, like at the K & 8th Street Market in South Boston. 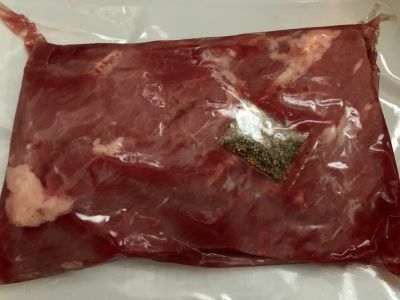 This type of corned beef is sometimes called gray corned beef because they do not use Nitrite in the "corning" process like the commercial vendors and that is what gives it that pink color. Corned beef has nothing to do with corn. The term comes from the process they used to use for preserving meat which was to rub it with large crystals of salt that resembled corn kernels and then letting it cure for a period of time. You can do it yourself at home if you have enough room in the refrigerator. 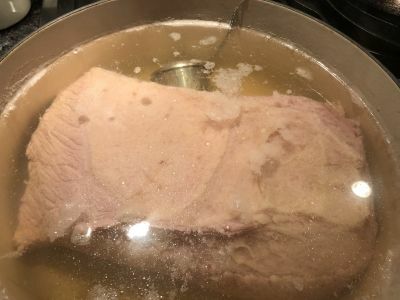 However, today most of the people that make their own corned beef use a brining process which is soaking the meat in a salt water solution to accomplish the pickling process. And you will probably notice that there are two cuts of corned beef, the Flat Cut and the Point Cut. The Flat Cut tends to be leaner while the Point Cut tends to be fattier. If you like nice slices of corned beef, use the flat cut. 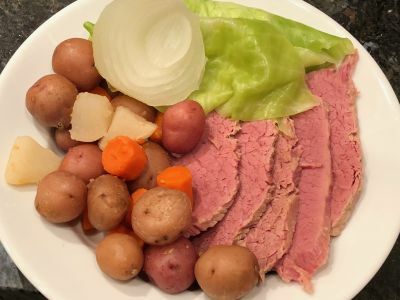 The corned beef pictured below in this recipe is a Flat Cut Corned Beef. So whatever kind of corned beef you decide to cook it is all good. And this is a relatively easy dish to make. It is very forgiving and will feed a large crowd if you have a big enough pot. 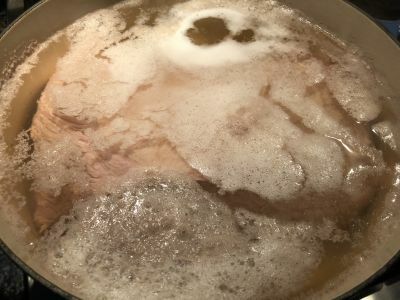 This recipe is accomplished by boiling the corned beef in a pot on the stovetop, thus the term New England Boiled Dinner. I like to do it for about 2 3/4 hours because I prefer the corned beef to hold together and not fall apart when you slice it. 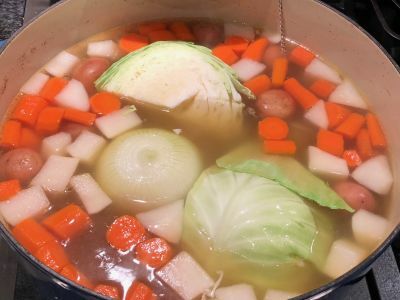 And you can cook the vegetables in the cooking liquid like I do in this recipe, or in a separate pot with just water or stock, or you can even roast the vegetables in the oven and serve them that way. The vegetables can be what you like although traditionally it will always include potatoes, onion and cabbage. I like carrots and also the root vegetables to be included as well, both of which are frequently part of a New England Boiled Dinner . But you do have some latitude here so put in what you like. 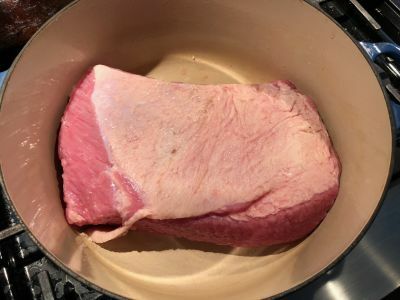 Make sure you cook a corned beef that is as big as what will fit in the pot so you have leftovers for the day after St. Patty's day for your Corned Beef Hash. It will help nurse you back to health after all that celebrating! So let's get cooking and have a safe and fun St. Patrick's Day wherever you are. Enjoy, or if you're Irish, Slainte! Note - If there is no spice packet, not to worry. Either use some pickling spice from the spice aisle at the grocery store or just toss in a bay leaf, some mustard seeds, coriander seeds, pepper corns and optionally a couple of cloves. About 1-2 tablespoons total. Note - All the ingredients are given without consideration to the amount of each. This is because it does not really affect the cooking time if I am cooking a 4 lb corned beef or a 6 lb corned beef. For the vegetables it is the same thing. You want to determine how many people you will be feeding and then just figure how many potatoes, onions and carrots each person will want. Approximately of course! 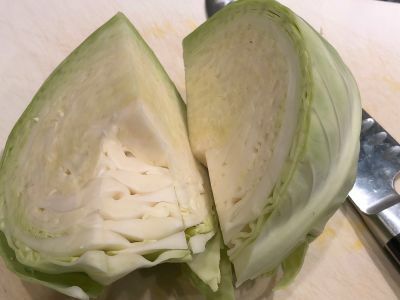 And usually you will do only one head of cabbage that will be cut into wedges and then separate the leaves once it is cooked, but you can obviously cook more if you want. 1. Rinse the corned beef. 2. Add it to a large dutch oven fat side up. Enameled cast iron, like Le Crueset, works very well here. 3. Cover it with water by about 1 inch. 4. Bring it just to a boil, reduce the heat, cover it partially and let it cook for 15 minutes. 5. After 15 minutes, skim the foam off the top of the water. 6. Add the spices to the Pot. 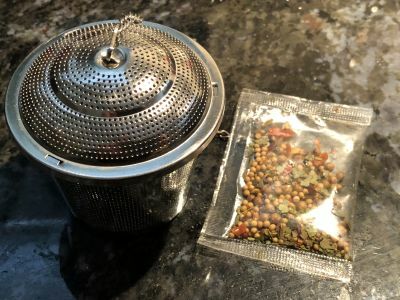 I use a tea strainer to keep the seeds from getting all mixed up with everything. You can also just wrap them in a piece of cheesecloth or just toss them into the water not wrapped at all. They certainly won't hurt anything. 7. 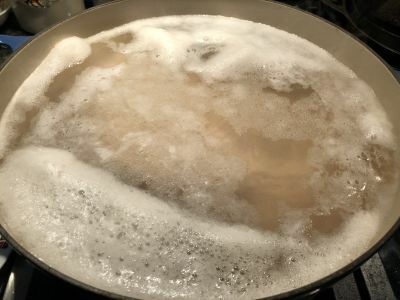 Bring the water to a simmer, cover the pot and cook the corned beef for about 2 1/2 hours, checking the pot occasionally to make sure it is just at a low boil. 8. About 10 minutes before the corned beef is done, if I am using whole onions I will put them in the pot with the corned beef for those last 10 minutes. Also at this time, preheat the oven to 200° F.
9. Remove the corned beef and put it in a 9" x 13" casserole dish and cover with foil. Place it in the preheated oven while the vegetables are cooking. 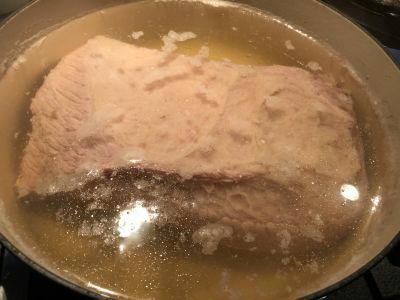 At this point, if you are going to be saving some of the corned beef for later, you can cut that piece off and put it on a plate and cover it loosely with foil until it cools. Then wrap it in foil and store it in the refrigerator for 3-4 days or in the freezer for several months. 10. Depending on how you like your vegetables, you can use small or large pieces and adjust your cooking time accordingly. 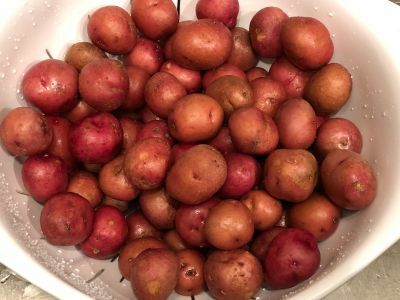 I like to use smaller potatoes and leave them whole but if they are larger I will cut them in half. 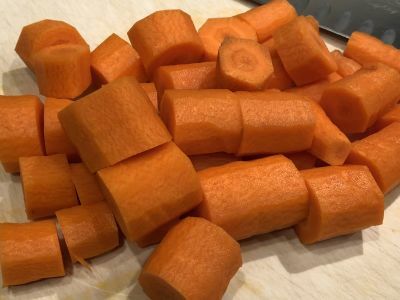 For carrots and turnips I cut them in 1" pieces. For onions I like to leave them whole and add them about 10 minutes before the potatoes and carrots. For the cabbage I like to quarter it and cook it that way and then before serving either cut it in chucks or just pull the leaves apart so everyone can get a little or a lot. 11. 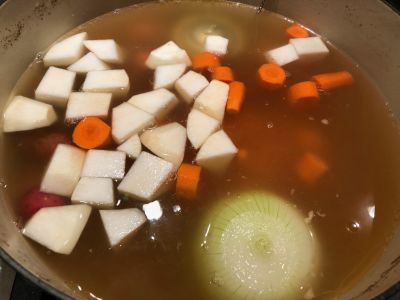 After removing the corned beef, add the potatoes, onions, carrots and root vegetables to the liquid and cook for 10 minutes. The onion has already been in the broth cooking for about 10 minutes at this point. 12. 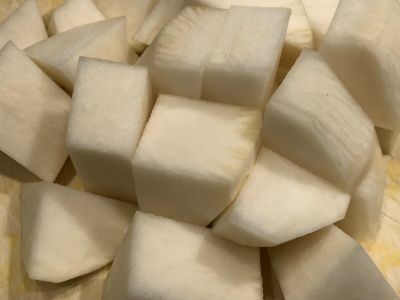 Cut the cabbage into wedges and remove the solid core. Add it to the pot and continue cooking for another 10-15 minutes until the vegetables are cooked to your liking. 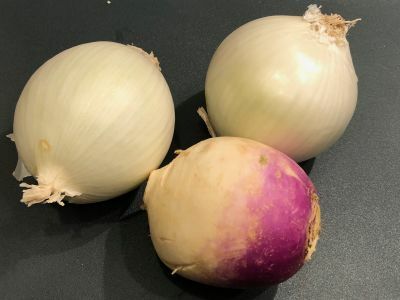 I tend to prefer some bite to the vegetables rather than having them be too soft but everyone has their preferences. And there will be long discussions (over beer of course) as to whether the cabbage should be lightly cooked so it still has a little crunch to it or cooked until it melts in your mouth like butter. 13. Remove the vegetables to a sheet pan or other wide platter to let them cool a little bit and stop the cooking process. 14. Remove the meat from the oven and slice it across in thin slices and arrange the slices on a platter. Place the vegetables around the meat and serve. Although it takes a while to cook, this really is an easy dish to make. And you can peel and chop the vegetables ahead of time so you're not doing that at the last minute. Serve this with your favorite mustard, a nice cold beer and some Irish music and have a great day! If you want to simplify this recipe even more, prep your vegetables, place them on a sheet pan, drizzle them with a little olive oil and roast them in the oven at 375° F during the last 30 minutes of cooking the corned beef. If you do that, add the cabbage in with the corned beef about 10 minutes before the roast is done and then remove the corned beef to a cutting board and cover it loosely with foil and let the corned beef rest for 10 minutes before carving. If you time it right it will all come out at the same time and it will be a great show. Print this recipe without the Introduction and Summary. Print this recipe with the Introduction and Summary. Share Your Opinion of this Recipe and How You "Make It Mine"
Please enter your name so people will know which comments are yours. You can use your real name or pick a user name if you prefer. To subscribe to our newsletter, enter your email address. And we never share any of your information with anyone, EVER! And if you submit a rating it must be accompanied by a comment and a name to be counted. This sounds fabulous. What does one use if they do not have a food processor? Also, can this recipe be frozen?